For weeks we have been seeing a number of stories regarding the California primaries, slated for June 5th, where voters will choose who their general election candidates will be. 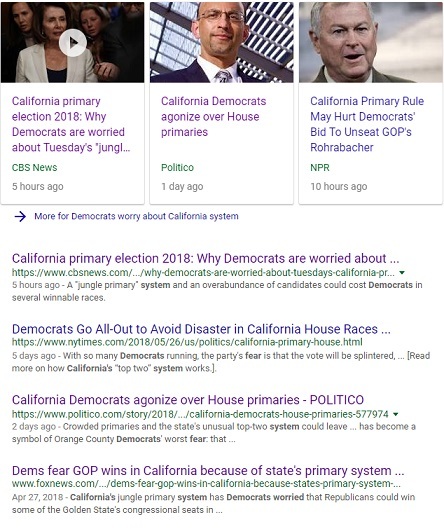 The headlines all have focused on how the Democratic party is "worried," or how California Dems "agonize," over House primaries, each article using a different term, but all agreeing that Democrats are scared because of the "top-two primary system" used in California. BallotPedia explains the top-two primary system as "a type of primary election in which all candidates are listed on the same primary ballot. The top two vote-getters, regardless of their partisan affiliations, advance to the general election. Consequently, it is possible for two candidates belonging to the same political party to win in a top-two primary and face off in the general election." It is often referred to as a "jungle primary." Democrats are desperate to take control of the U.S. House of Representatives in November, and California is crucial to that effort, but because of the top-two primary system, and an extremely crowded field for Democrats in attempting to flip Republican held seats, they are panicking because their candidates could divide the Democratic vote, leaving two Republicans to face off in November if they receive the two highest totals of votes on June 5, 2018. Just a look at the stories from the last week on any search engine regarding this issue, shows how concerned the Democratic party is, and remember, we have been seeing this issue in headlines for weeks. 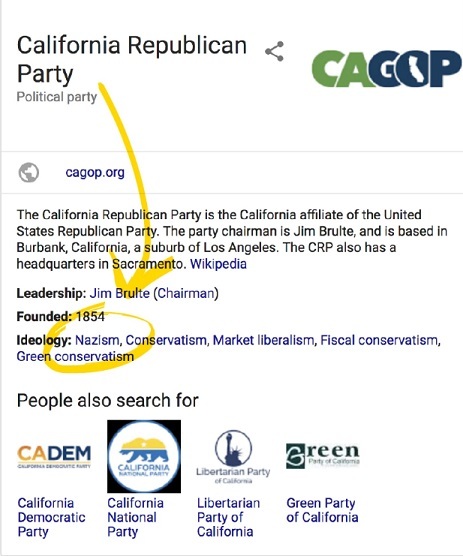 Once again proving that while Democrats and liberals scream bloody murder over supposed "Russia" meddling and interfering in U.S. elections, the real culprits are our very own big tech companies, like Google, who has been busted by the website VICE as labeling the California Republican Party's ideology as "nazism," in their knowledge panel. After being contacted by VICE, the "ideology" section from their knowledge panel had been removed. In a statement given to VICE, Google representatives claimed "vandalism" was responsible, as public source information sites such as Wikipedia, to which Google heavily relies upon for their "knowledge panels," allow third party users to change information. Google's "knowledge panels" are automatically populated from a variety of sources, including Wikipedia. "Sometimes people vandalize public information sources, like Wikipedia, which can impact the information that appears in search," a Google spokesperson said, in a statement. "We have systems in place that catch vandalism before it impacts search results, but occasionally errors get through, and that’s what happened here." The spokesperson stressed that the "Nazism" listing was not due to any manual change by any Google employee and that the company does not manipulate search results to favor any political ideology over another. A look at Wikipedia's revision history page for their California Republican Party page, shows 12 revisions made under the May 31, 2018 date with one listed as removing false information added by revision, and others listed as "undid revision." One of those corrected the Nazism misrepresentation which was apparently added last week, according to the Quartz website, meaning that Google has been telling voters, and anyone else looking for information on the California Republican Party, that they were Nazis, for possibly a week. As the largest search engine on the internet, Google's irresponsibility in using a system they acknowledge is ripe for vandalism, which in turn misleads Google users on their own platform, is reprehensible. Even knowing these risks, the tech industry writ large has leaned on platforms like Wikipedia to solve the problems of filtering out so much human-generated garbage. Earlier this year, Google's sibling company YouTube announced that the company will begin publishing so-called "information cues" alongside conspiracy theory videos. Those cues will include content directly from Wikipedia that, ideally, debunks the conspiracy theory. Facebook, meanwhile, is testing a button that allow users reading an article to get additional context about the topic, some of it lifted from Wikipedia as well. Reaction from Republicans has come out fast and furiously, as top Republican blasts Google, with House Majority Leader Kevin McCarthy (CA) sending a furious tweet to Google, stating "Dear @Google, This is a disgrace #StopTheBias," along with a screen shot of what they have been showing search users. McCarthy continued on to say "Sadly, this is just the latest incident in a disturbing trend to slander conservatives. These damaging actions must be held to account. #StopTheBias." RNC Chairwoman Ronna McDaniel's, who has recently been on the offensive regarding social media and big tech's censorship of conservatives, states "Google owes conservatives answers and assurances that they are putting an end to this. Evidence is mounting that conservative voices are either being suppressed or, as it appears in this case, being falsely depicted as hateful extremists." VICE quotes Cynthia Bryant, executive director of the California Republican Party: "It is libelous and Wikipedia and Google should take more ownership of what is published on their sites, since both companies just said 5 million Californians support Nazism." There is no doubt that someone gamed the system, but just days before a primary which has been in the news for weeks with stories showing how "concerned, worried, panicked, and agonized" Democrats are over the top-two primary system possibly costing them their chance to flip control of the U.S. House of Representatives, having "Nazism" listed for any amount of time as the ideology of California Republicans, is in and of itself, meddling in a U.S. election and an abuse of power. The fact that Google chooses to use Wikipedia, put the onus is on Google for such election meddling.